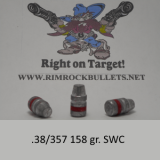 .357 Keith SWC-FB gr. (BHN 15) If you like Keith bullets this is the one for the .357 mag 3 boxes will fit in a USPS flat rate box. 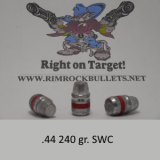 I have cast this bullet in the past but appreciate the hard alloy used ty RimRock and the consistent weight of 170 grains. I seated these to the front of the front driving band in new Starline brass to fit SP101 chambers-case grip wias quite firm. 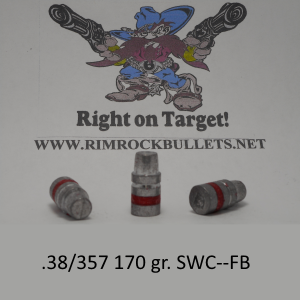 Charge was 13 gr 2400 and standard remington primer -the charge coming right to the base of the bullet. 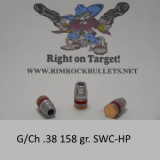 Five round velocity averages were much more consistent than the current hand book loads with less than 100 percent density and loaded to 9mm pressures: Ruger GP100 6" bbl: 1426 fps 14 fps ex spread; Ruger Sp101 4.2" bbl 1335 fps 60 fps " " Ruger Sp101 2.4"bbl 1231 fps 35 fps spread. 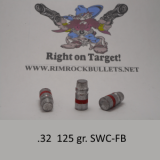 I purchased 1,000 of these bullets about a year ago and they shoot superbly out of my 6.5" Ruger Blackhawk loaded in Starline brass with a Federal 200 primer and 13.0 grains of Alliant 2400. This load averages about 1170 from my revolver with excellent accuracy. 170gr SWC - Keith, Winchester 1894 Trapper 16.5"barrel, 357 mag, loaded 11.0 gr Blue Dot, produced 2" groups @100 yards. NOT TO BAD! Frank, I appreciate the quality of the product you provide. 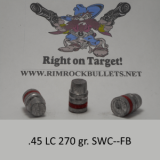 The 170 grain Keith Bullet with 16.5 grains of Alliant 300-MP is a tack driver at 200 yards with a rossi 92 and my Ruger GP 100 shoots the same load well out to 100 yards easily. 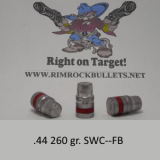 Your bullets seem to be of higher quality than other brands I have tried and your prices are great for a premium bullet. I look forward to trying some of your other designs and calibers. Keep up the good work Chris F.